Resist! It’s a sunny afternoon and you find yourself in your favorite home improvement store. You stroll down the electrical aisle in search of a replacement wall plate and, BAM, there it is, DIY lighting control. Dimmers, outdoor lighting…Oh, just imagine…”Honey, did you turn off the basement lights? No? Ok [picks up remote], I got it.” Bliss. Sigh. You round the corner and on the end-cap display, spotlighted as if the clouds have parted and sopranos are welcoming a new dawn….motorized window shades! With a remote! Simple, elegant…You’ve been dreaming about blackouts for the Master Bedroom and Home Theater…maybe a lighter weave for the family room to protect the furniture, ease glare on the TV and block the heat…sounds perfect but….not so fast! While DIY has its place, we caution you when it comes to automated lighting control and motorized window shades. We’ve recently experienced many homeowners calling to ask us to re-program their lighting and window treatments, integrating their weekend project into their system, only to find out that what they’ve installed is a single-room solution. For us, the beauty of whole-home lighting and shade is just that – a whole-house integrated system. Pre-set configurations; all-on/all-off, entertain, away, Good Morning!, Goodnight! modes– Portrait lights on while the shades are down, can lights on with shades at 50%….elegance, control and options galore! So, be tempted by that jaw-dropping display…be inspired…but before placing anything in your cart, please check with us to learn your options. We want to be sure you’re happy with your investment. Put the drill down and pick up the phone. We got this! So, what is a SMART home or technology-enabled workplace? And what makes it so smart to have? It seems to be a lot of things, and for a variety of reasons. To some, it’s an all-in-one remote (and we mean the whole house) control. To others, it’s a mobile security system. It’s a convenience, it adds to your home’s resale value, it supports energy efficiency, and the list goes on. But what’s the common denominator? What makes the home automation market worth a projected 78.27 billion dollar industry by 2022? It’s simple; it simplifies your life. Granted, it’s elegant, it’s a solid investment, it enables you to be remote, it’s all those things, but what it really does is make life easier. And isn’t that nice to come home to? What’s important to you? What features would simplify your lifestyle or make your place of business more efficient and secure? What would you want to control? Now consider compatibility. Think about your favorite services such as Pandora, napster, Deezer …and your favorite tech- friendly products like Sonos, echo, Lutron – all can be integrated onto one platform. So what’s the trick to get all these devices and services to work together? That part you leave to the professionals. No stress, remember? 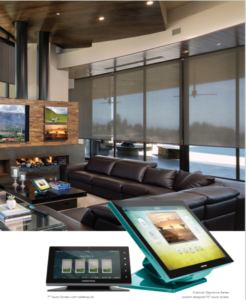 Technology is quickly evolving and today’s home automation integrators stay on top of these cutting-edge technologies. They have continuous training and proper certifications to get your disparate pieces to blend in unison. Music to your ears? We think so. Now, don’t you feel smart?